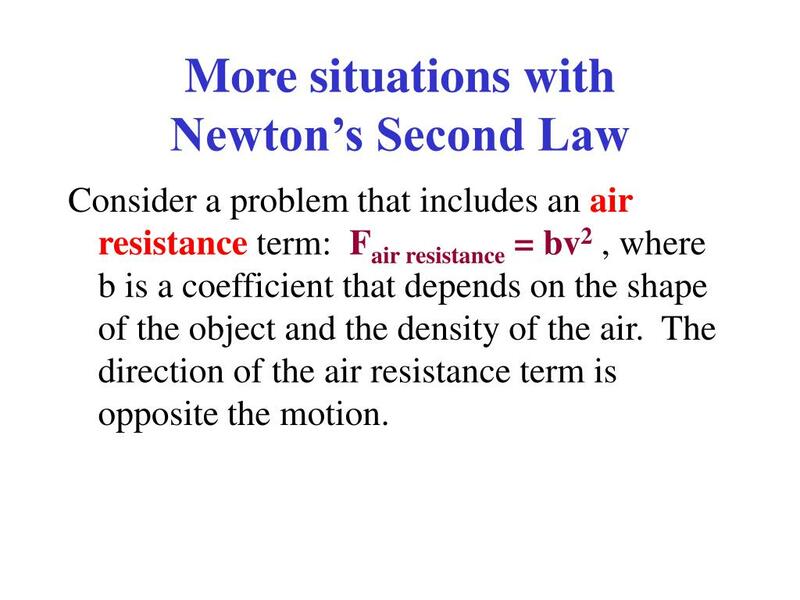 More situations with Newton’s Second Law Consider a problem that includes an air resistance term: F air resistance = bv 2 , where b is a coefficient that depends on the shape of the object and the density of the air. 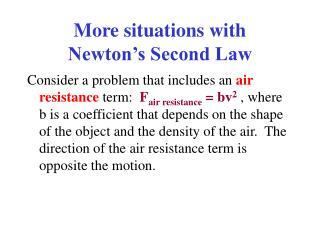 The direction of the air resistance term is opposite the motion. 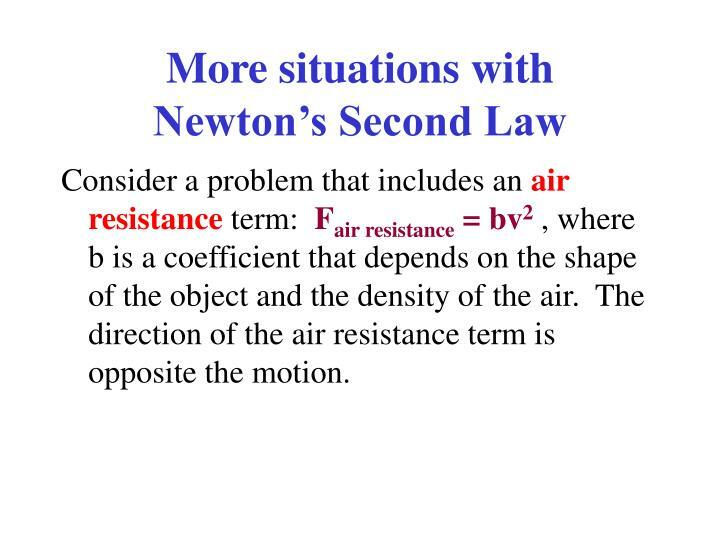 Consider a problem that includes an air resistance term: Fair resistance = bv2 , where b is a coefficient that depends on the shape of the object and the density of the air. 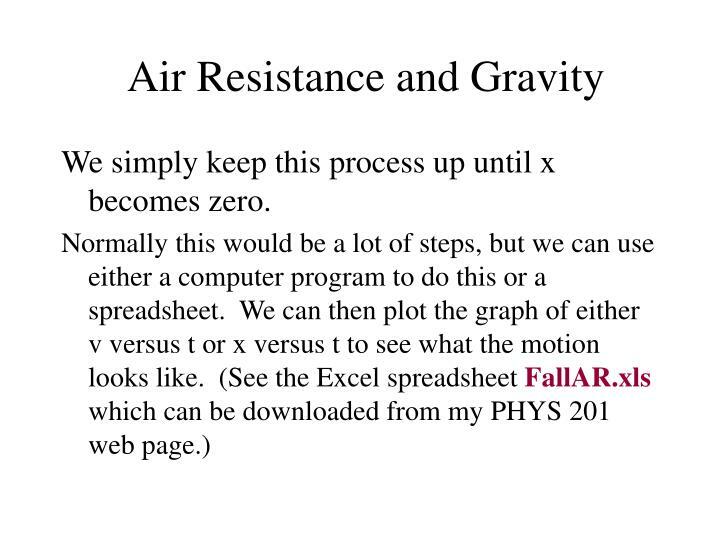 The direction of the air resistance term is opposite the motion. we have FAR = bv2 directed up. which is a differential equation with v(t) being the solution. 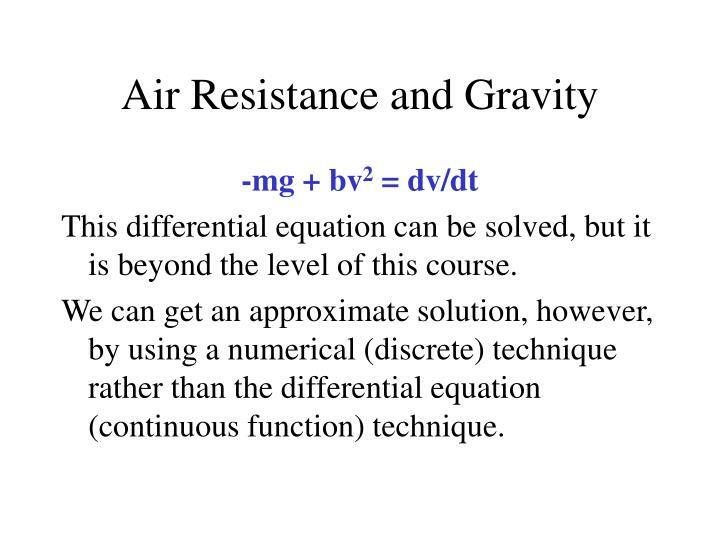 This differential equation can be solved, but it is beyond the level of this course. We can get an approximate solution, however, by using a numerical (discrete) technique rather than the differential equation (continuous function) technique. 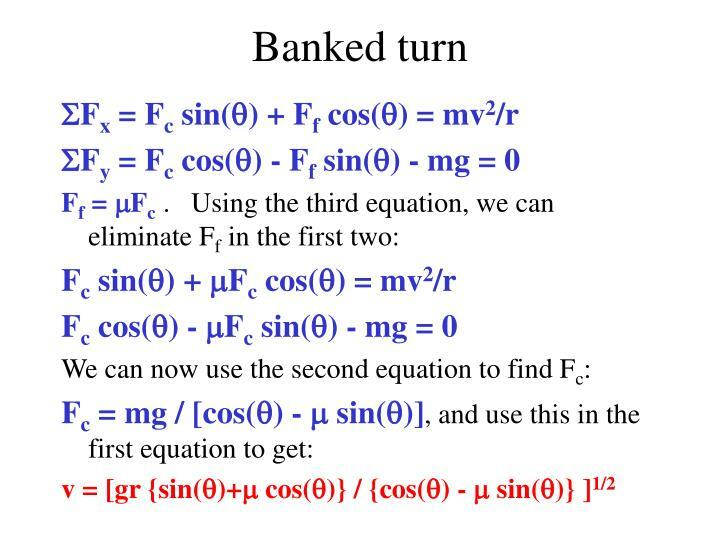 The first step is to calculate the forces based on initial conditions. 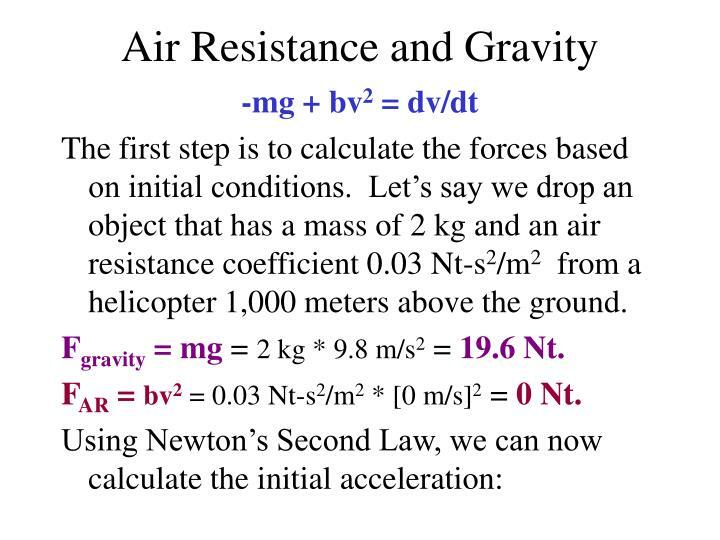 Let’s say we drop an object that has a mass of 2 kg and an air resistance coefficient 0.03 Nt-s2/m2 from a helicopter 1,000 meters above the ground. 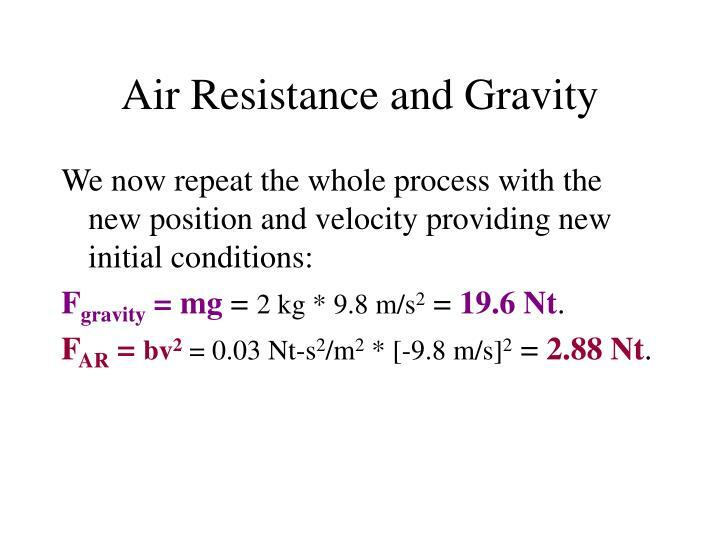 Fgravity = mg = 2 kg * 9.8 m/s2 = 19.6 Nt. FAR = bv2 = 0.03 Nt-s2/m2 * [0 m/s]2 = 0 Nt. 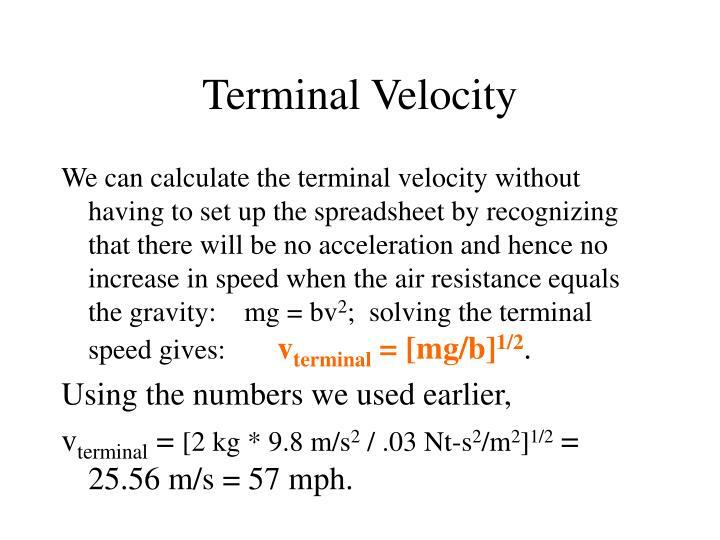 v1 = 0 m/s + (-9.8 m/s2)*(1 sec) = -9.8 m/s. FAR = bv2 = 0.03 Nt-s2/m2 * [-9.8 m/s]2 = 2.88 Nt. v2 = -9.8 m/s + (-8.36 m/s2)*(1 sec) = -18.16 m/s. x2= 995.1 m + ½(-9.8 m/s + -18.16 m/s)*(1 sec) = -981.12 m.
We simply keep this process up until x becomes zero. To see the effects of different air resistance coefficients, we simply change the value of b and run the program again or recalculate the spreadsheet. 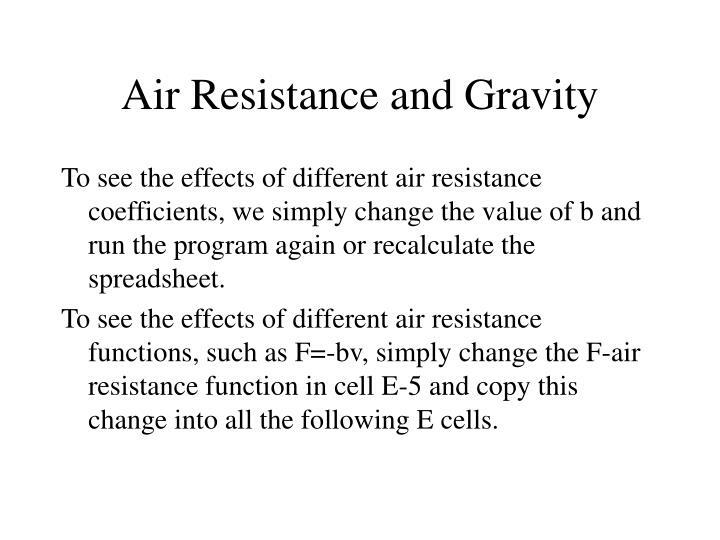 To see the effects of different air resistance functions, such as F=-bv, simply change the F-air resistance function in cell E-5 and copy this change into all the following E cells. 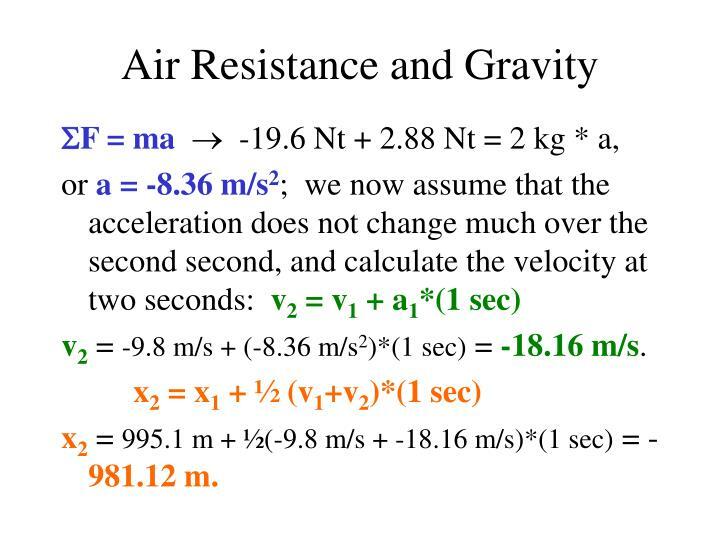 As we can see from the spreadsheet, the velocity does not continue to increase (as it would without air resistance), but instead it approaches a terminal velocity. 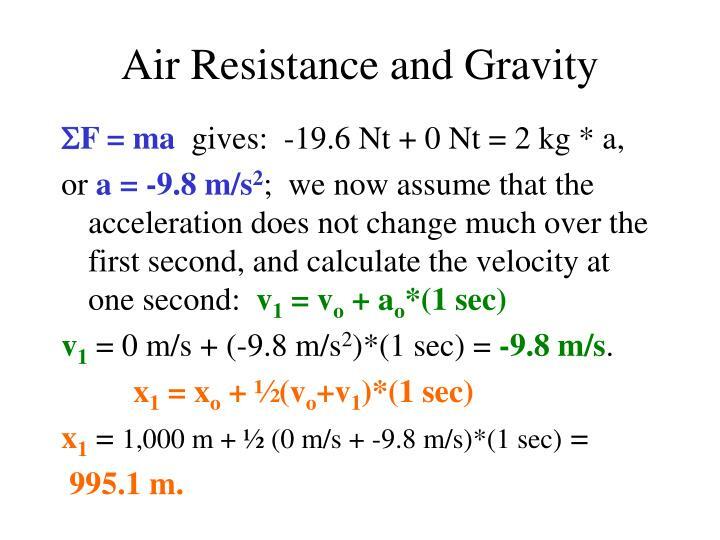 This is because as the speed increases due to gravity, the air resistance also increases which acts against gravity. 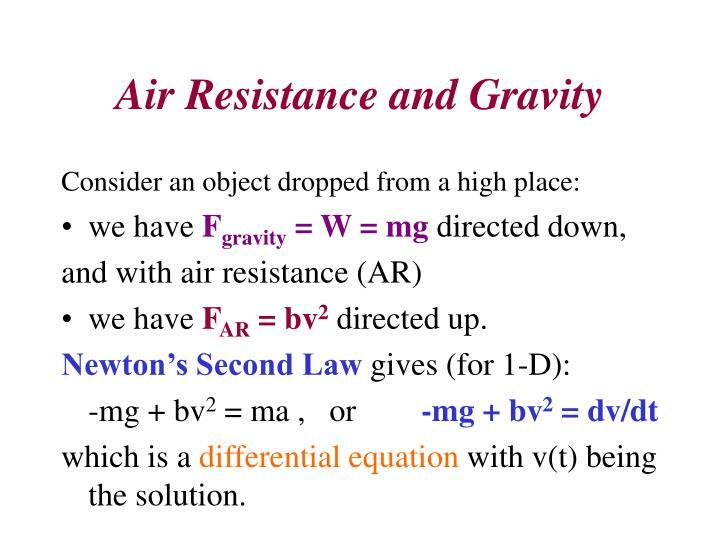 As the air resistance approaches the strength of gravity, the net force approaches zero and so the acceleration also approaches zero, and the velocity levels off. 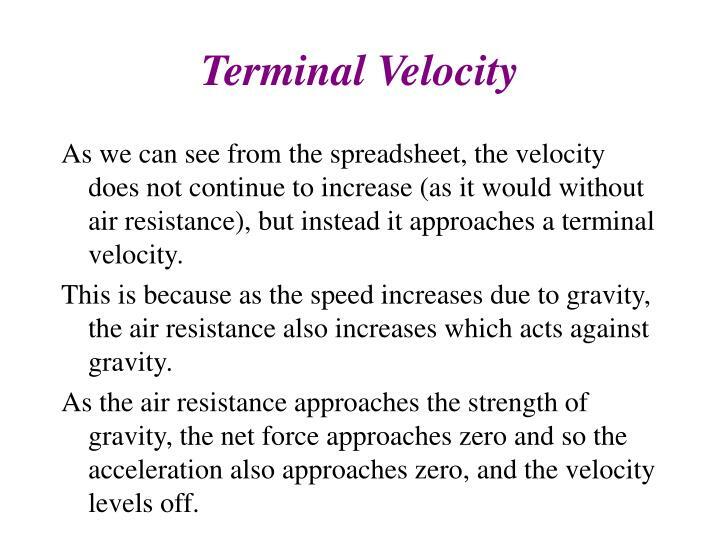 We can calculate the terminal velocity without having to set up the spreadsheet by recognizing that there will be no acceleration and hence no increase in speed when the air resistance equals the gravity: mg = bv2; solving the terminal speed gives:	vterminal = [mg/b]1/2. vterminal = [2 kg * 9.8 m/s2 / .03 Nt-s2/m2]1/2= 25.56 m/s = 57 mph. 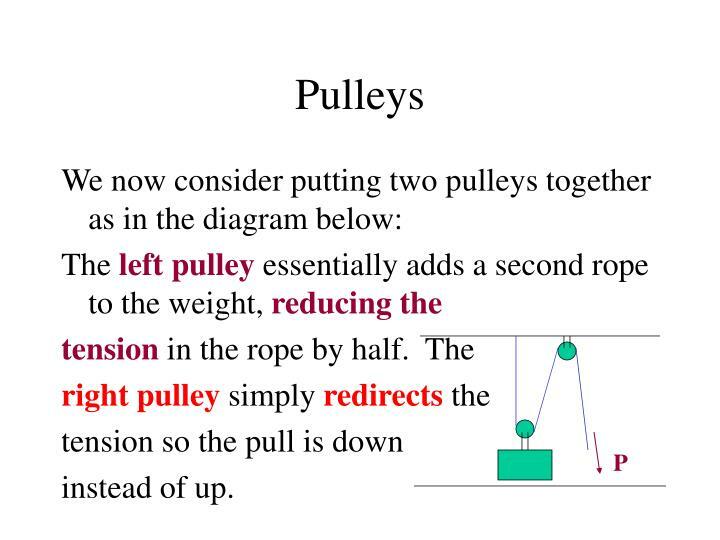 We use ramps and pulleys to make it easier to do certain things. 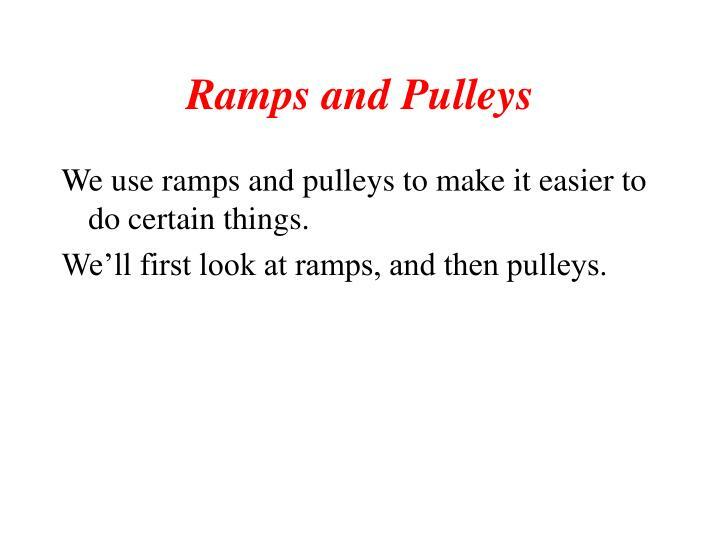 We’ll first look at ramps, and then pulleys. 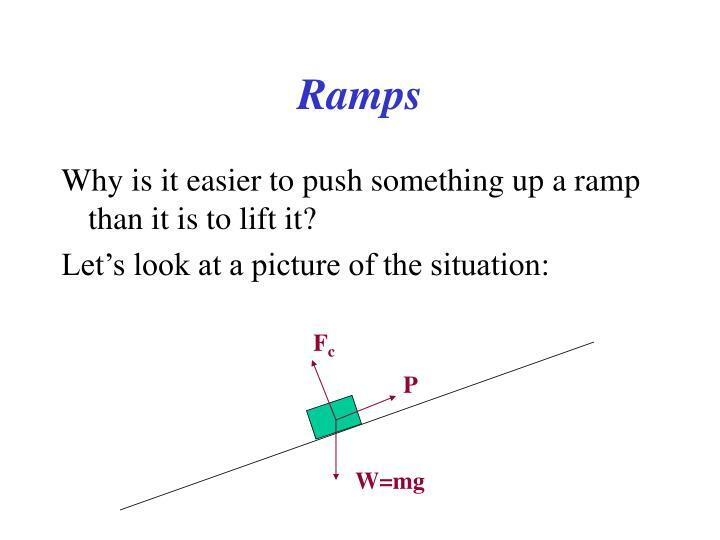 Why is it easier to push something up a ramp than it is to lift it? 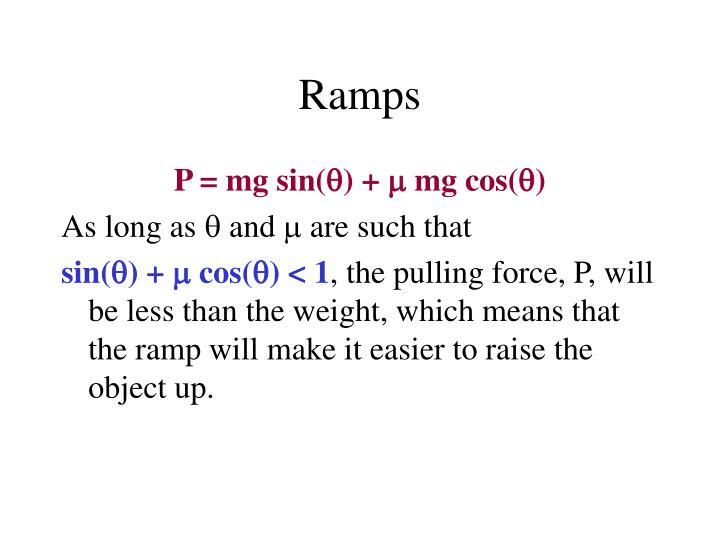 sin() +  cos() < 1, the pulling force, P, will be less than the weight, which means that the ramp will make it easier to raise the object up. 1. 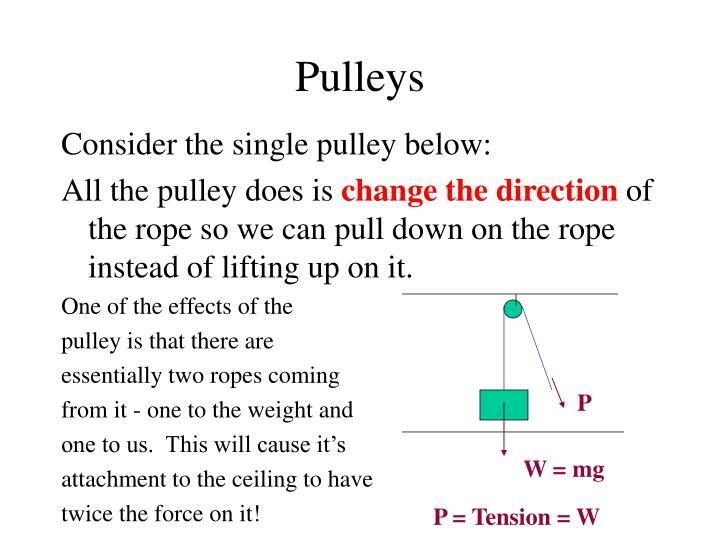 Pulleys can change the direction of a force - sometimes it is easier to pull down than to lift up. 2. 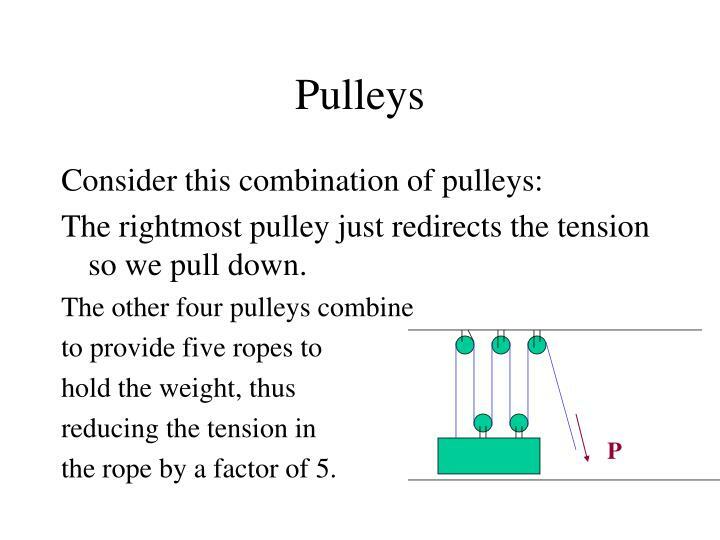 Pulleys can “add ropes” to an object to reduce the tension in the rope, and hence reduce the pull we need to apply. 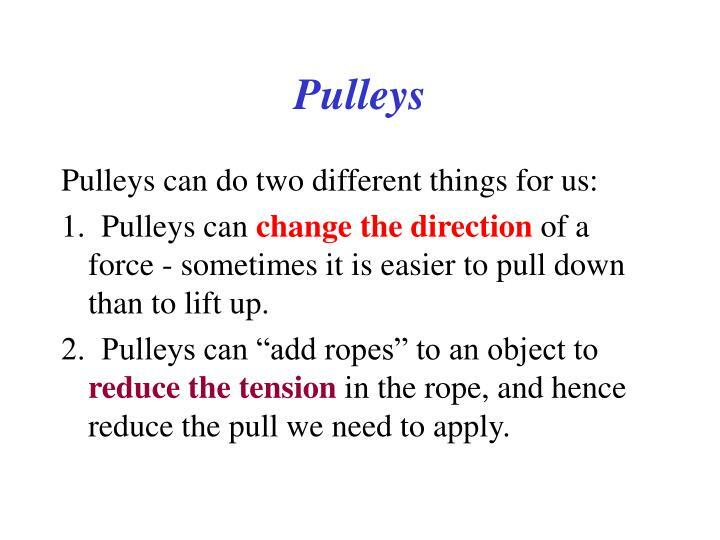 All the pulley does is change the direction of the rope so we can pull down on the rope instead of lifting up on it. twice the force on it! 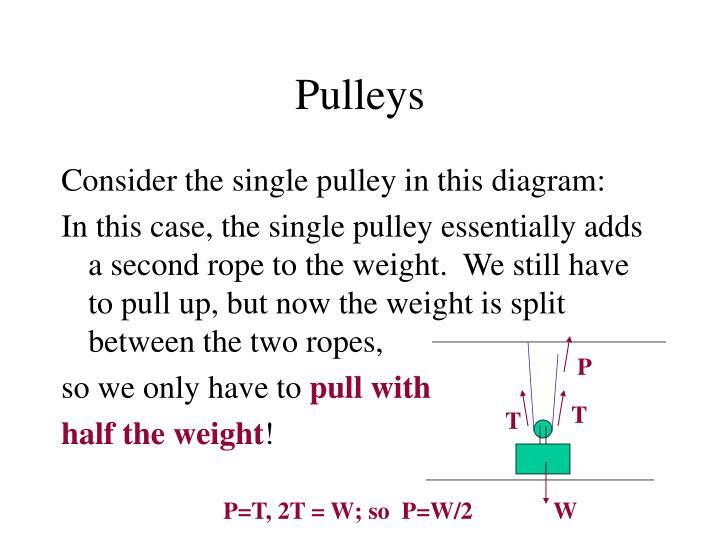 The rightmost pulley just redirects the tension so we pull down. the rope by a factor of 5. Consider first a car making a right turn on a level road. To make the turn, the car must go in a circle (for a 90o turn, the car must go in a circle for 1/4 of the complete circle). This means that there will be an acceleration towards the center of the circle, which is to the right for a right turn. a = w2r, and v=wr; or a = v2/r. 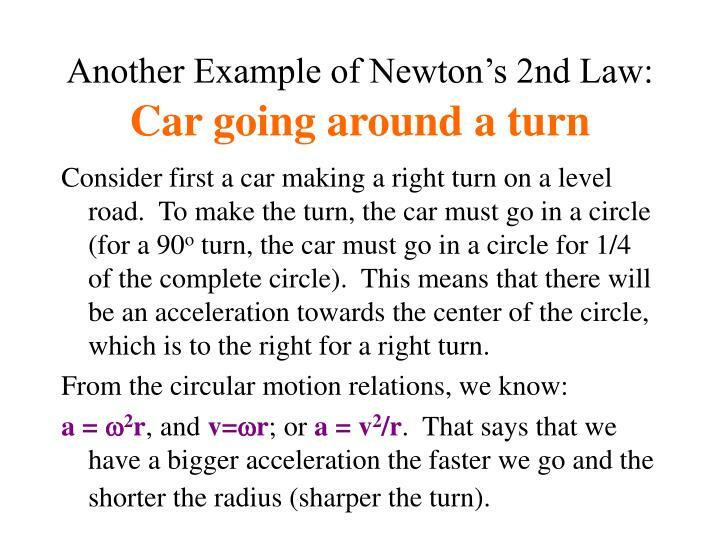 That says that we have a bigger acceleration the faster we go and the shorter the radius (sharper the turn). What are the forces that cause this circular acceleration? does it act (left or right)? Car is heading into the screen. 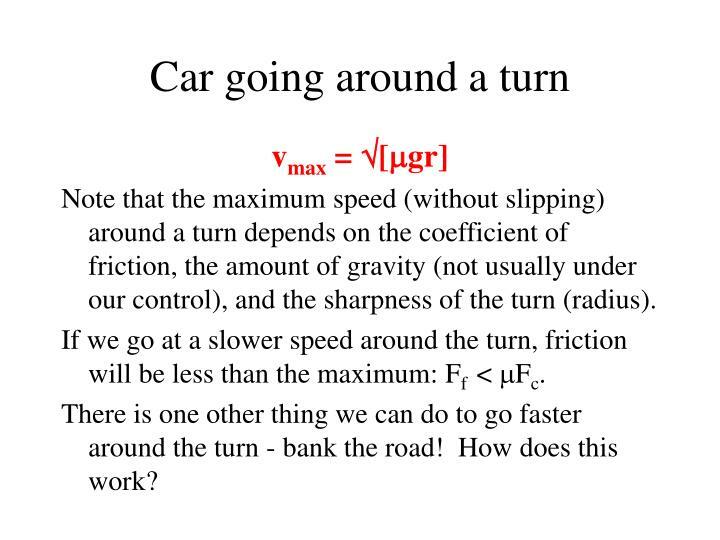 Note that the maximum speed (without slipping) around a turn depends on the coefficient of friction, the amount of gravity (not usually under our control), and the sharpness of the turn (radius). 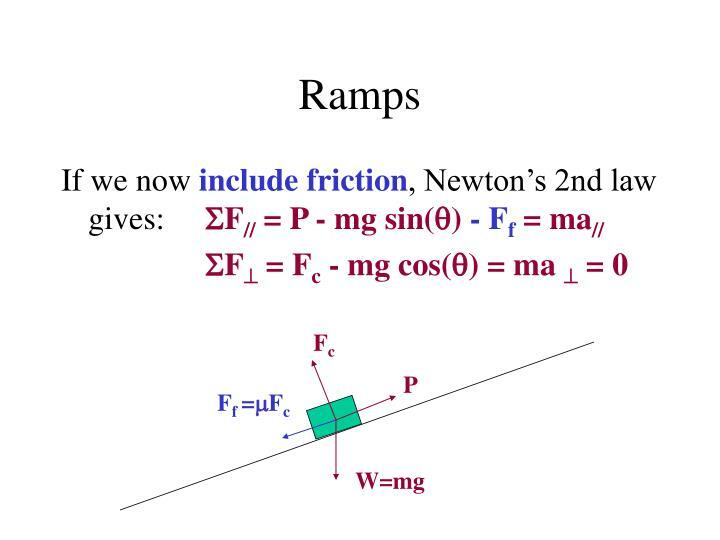 If we go at a slower speed around the turn, friction will be less than the maximum: Ff < mFc. 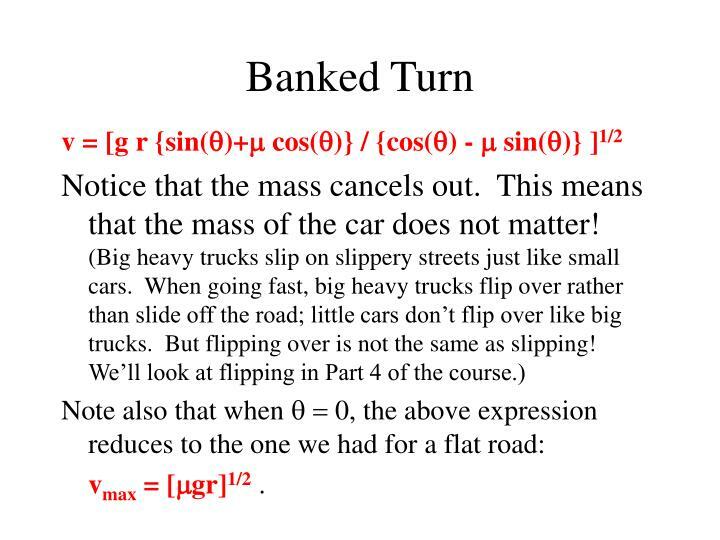 There is one other thing we can do to go faster around the turn - bank the road! How does this work? 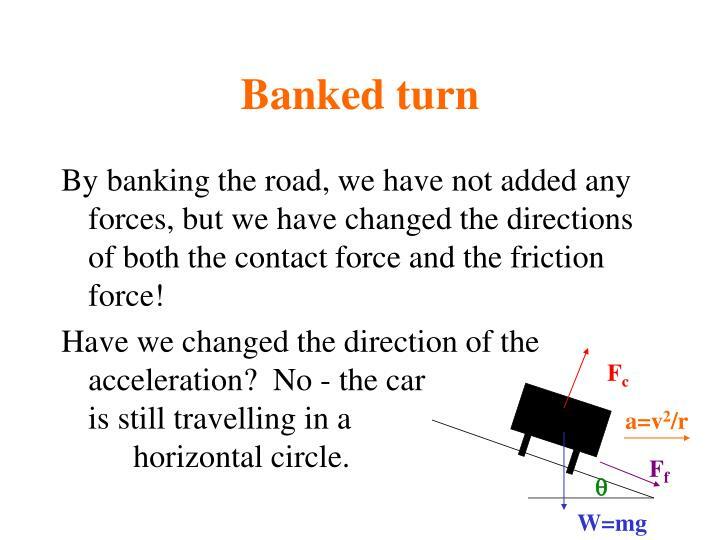 By banking the road, we have not added any forces, but we have changed the directions of both the contact force and the friction force! 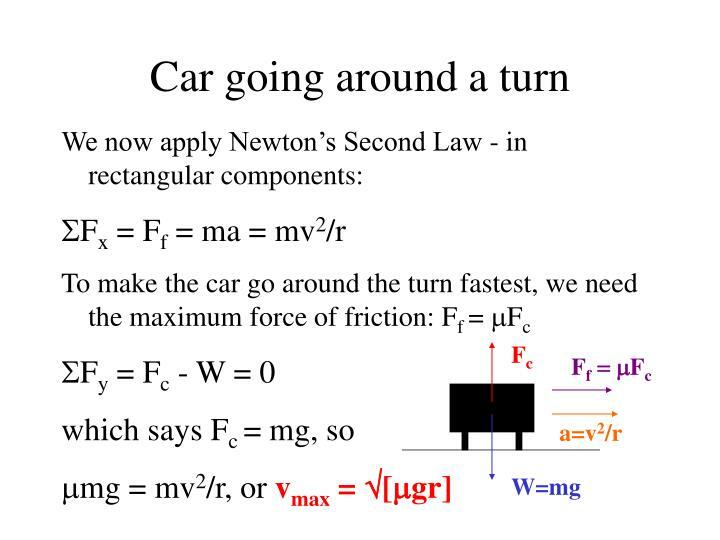 Have we changed the direction of the acceleration? No - the car	is still travelling in a horizontal circle. friction: Ff = mFc . 3 unknowns: Ff, Fc, and v.
Note that as m sin(q) approaches cos(q), the denominator approaches zero, so the maximum speed approaches infinity! 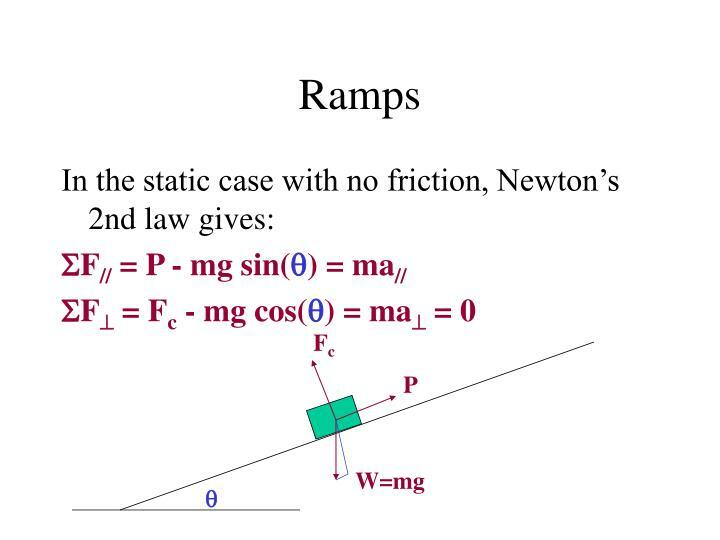 What force really supports such large speeds (and so large accelerations)? 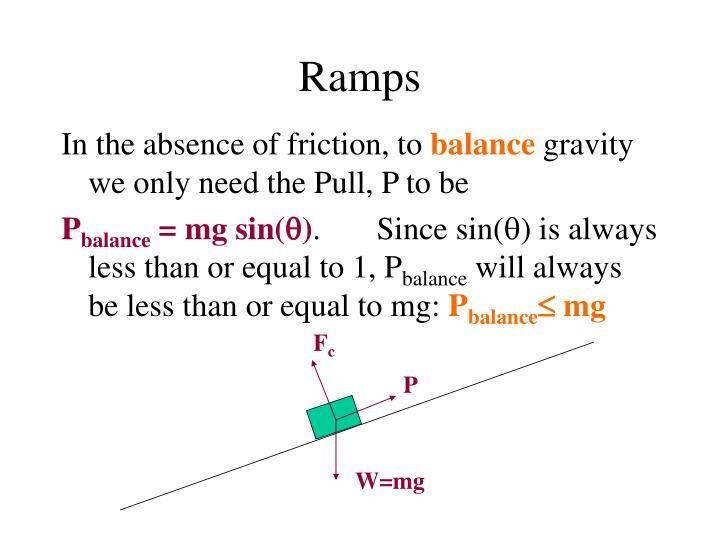 As the angle increases, the contact force begins to act more and more to cause the acceleration. 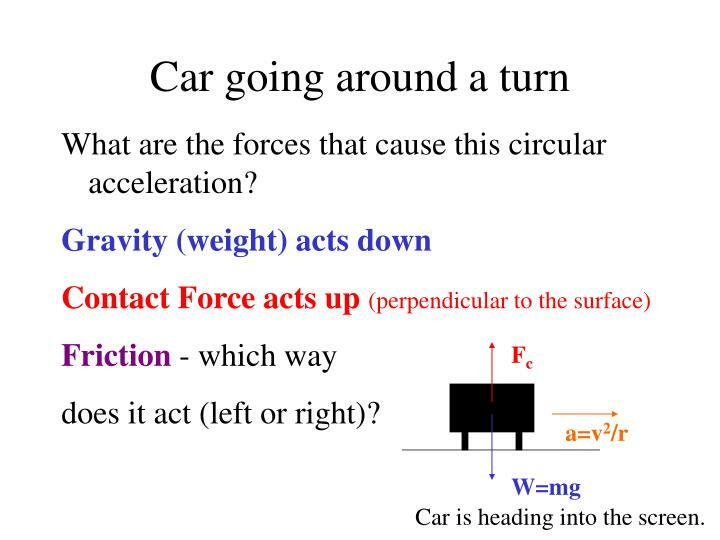 And as the contact force increases, so does friction. 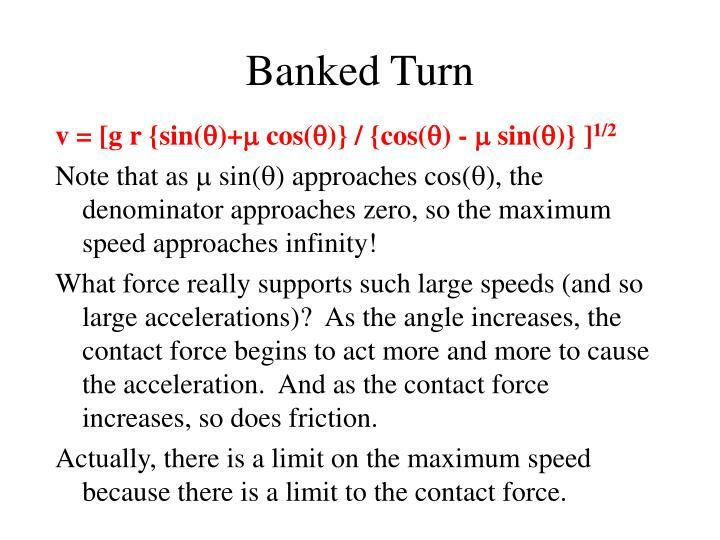 Actually, there is a limit on the maximum speed because there is a limit to the contact force. 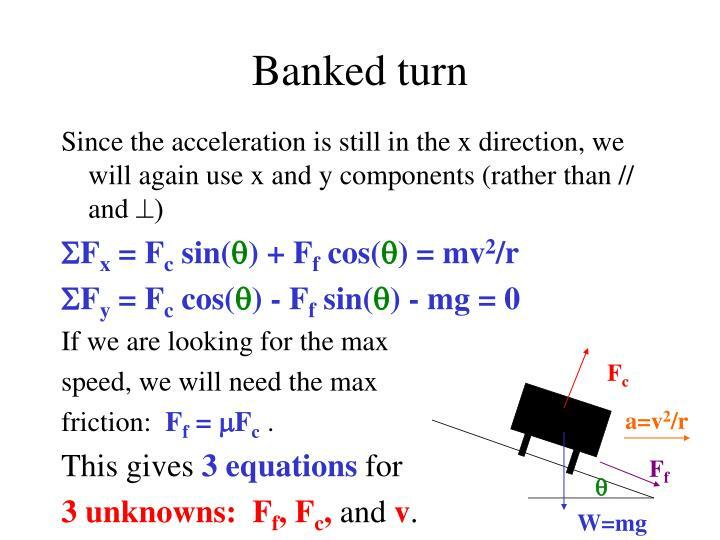 Is there a minimum speed for going around a banked turn? 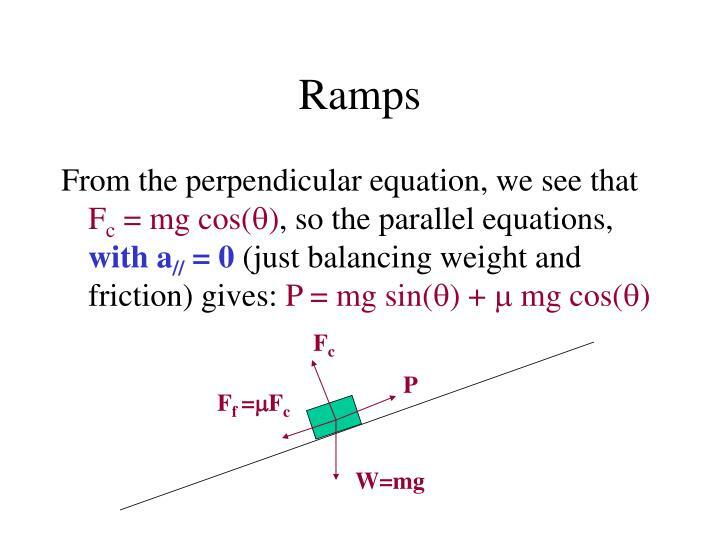 Consider the case where the coefficient of friction is small and the angle of bank is large. 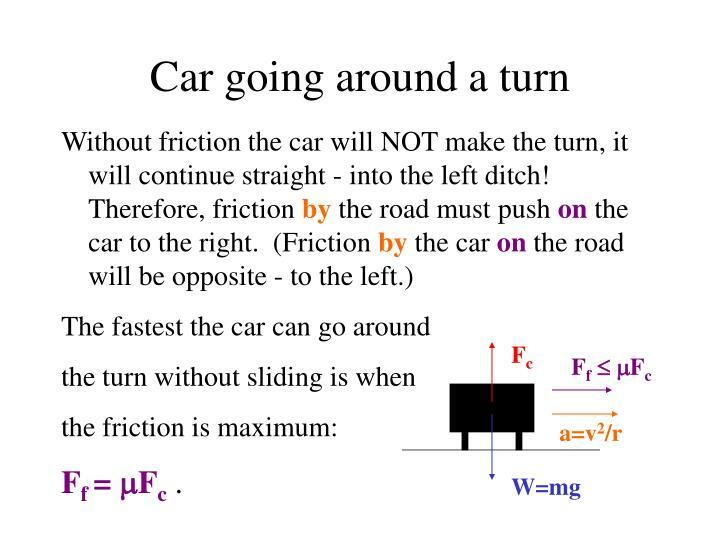 In that case the car, if going too slow, will tend to	slide down (to the right) so	friction should act to the left. 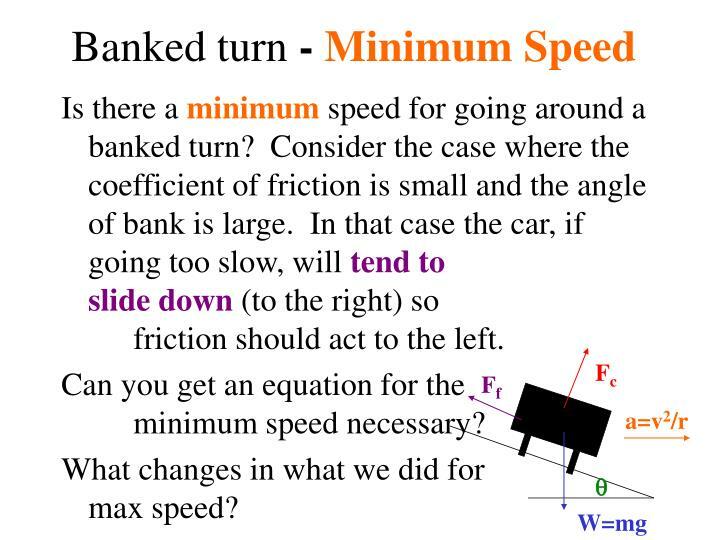 Can you get an equation for the	minimum speed necessary? What changes in what we did for	max speed?